Burger 10 Turns Up the Heat with its New Flame Grilled Marinated Chicken Wings. Try our newest sidekick; “Flame Grilled Marinated Chicken Wings” for only $7.50 serve with Garlic Cream Dip. Burger 10 Sydney announced today that it is introducing the new Flame Grilled Marinated Chicken Wings a new side item that combines a bold kick of lemon, garlic oregano spices serve with garlic cream dip. 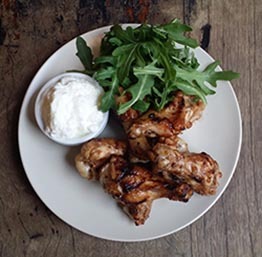 A succulent, flame grilled marinated chicken wings, a delicious snack that Sydney siders can enjoy. “Even though our sole concept are burgers, we see that there is a demand for chicken too, said Executive Chef Hussein Jaber. “It is exciting, it will surely turns up the heat and customers will love the succulent flame grilled taste in a chicken. Adding a new side will give our customer options to choose along with their favourite burgers, added Chef Hussein.” This new side is now available at Burger 10 Glebe for retail price of $7.50 as Sides and you have option to upgrade as Main for only $12.50 applies to dine in and takeaway orders. Burger 10 recently awarded as 2016 City of Sydney Business of the Year & Outstanding Fast food and Takeaway by Inner West Local Business Awards.